Most in Redsland were securely in the bed Wednesday night when the Reds’ offense woke up. The Reds scored four in the eighth and four in the ninth to win 11-7. It was the Reds’ 35th comeback win of the year and 15th win via runs in the final at-bat. The Reds, winners of five straight, moved to three games ahead of the St. Louis Cardinals in the National League Central. St. Louis lost to Milwaukee 3-2 earlier Wednesday. The Reds pounded out 18 hits without Votto, who scratched with a stiff back. Eight players drove in a run. Five players had at least two hits. Bruce went 4-for-5 and finished a double short of the cycle. Ramon Hernandez was 3-for-4. Jim Edmonds went 2-for-5 with his first homer as Red and a double. Laynce Nix drove in three runs. For all the offensive fireworks, the Reds used small ball to get the lead before breaking it open. Edmonds led off the ninth with a double. Scott Rolen got him to third with a grounder to second. “The shot heard around the world,” Rolen said. Pinch-hitter Chris Heisey put down a perfect squeeze. 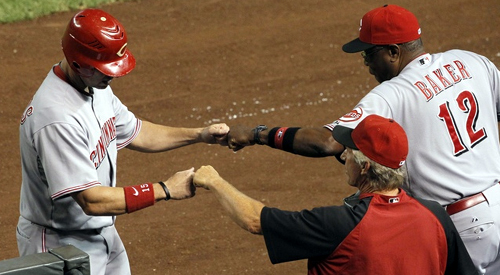 So perfect that Heisey beat it out for a hit. Bruce followed with his fourth hit of the night. Hernandez was hit by a pitch to load the bases. Paul Janish made it 9-7 with a sacrifice fly. Nix doubled in two more. As the Cincinnati Reds continue their already successful West Coast road-trip, Whack Reds will be camping at China Lake, Maine. Unfortunately, we will be internet-free for most the time and will be struggling to update ourselves on the Reds' progress. Crap. We can't promise more than a few lousy posts over the weekend, but wait, we never promised our readers anything. Hopefully, the Reds will continue to win series' while building an even larger lead above the St. Louis Cardinals in the NL Central. Go Redlegs!